da Vinci ® Myomectomy is performed with the da Vinci ® Surgical System, which allows your surgeon to perform a minimally invasive, yet remarkably precise, comprehensive reconstruction of the uterine wall, regardless of the size or location of your fibroids. The unique level of control and precision provided by da Vinci ® can also help your surgeon provide the most precise and thorough reconstruction possible, helping to prevent possible uterine rupture (tearing) during future pregnancies. As with any surgery, these benefits cannot be guaranteed, as surgery is both patient- and procedure-specific. While myomectomy performed using the da Vinci Surgical System is considered safe and effective, this procedure may not be appropriate for every individual. Always ask your doctor about all treatment options, as well as their risks and benefits. Lumsden MA. Embolization Versus Myomectomy Versus Hysterectomy: Which is Best, When? Hum Reprod. 2002; 17:253-259. Review. Becker ER, Spalding J, DuChane J, Horowitz IR. 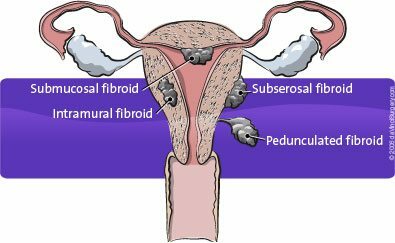 Inpatient Surgical Treatment Patterns for Patients with Uterine Fibroids in the United States, 1998-2002. J Natl Med Assoc. 2005 Oct;97(10):1336-42. Wolanske KA, Gordon RL. Uterine Artery Embolization: Where Does it Stand in the Management of Uterine Leiomyomas? Part 2. Appl Radiol 33(10):18-25, 2004. Medscape.10/27/2004. Advincula AP, Song A, Burke W, Reynolds RK. 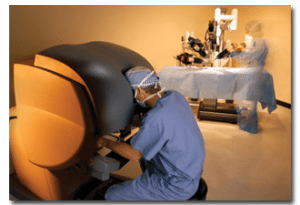 Preliminary Experience with Robot-Assisted Laparoscopic Myomectomy. J Am Assoc Gynecol Laparosc. 2004 Nov;11(4):511-8.